Location was awesome! Staff was wonderful. Apartment wag huge with great views, very clean and well equipped. loved the views and the size of the space - great apartment and location! The location is great! Close to restaurants, museums and has parking available close by for an extra fee. The apartment was comfortable and very clean. I liked that the bedrooms were on one level and the living area kitchen on another. The staff was very responsive when I had questions before our arrival. The apartment was spacious, clean and interesting (quirky). Great closet space, fabulous kitchen and appliances (including washer/dryer). Great place to work upstairs separate from downstairs bedrooms. Great location for city living, not in the old area, in the newer urban area. The old area is a 15-min walk. Close to three choices of transport (subway, bus and tram). Perfect location. Modern and comfortable apartment. Efficient and convenient check-in and check-out . The service was terrific. Any small issue we had was taken care of immediately. The location and amenities were fabulous. We loved our stay at Chiado Apartments and highly recommend it. Very large and comfortable apartment. We were that 4 adults and 3 childrens and it was very nice. The apartment and rooms are big. 2 separstes bathrooms. The beds are very comfortable. In the upper floor there is a big kitchen and a large leaving room with big table and sofa. Also the apartment is very central - 2 min from Chiado metro station. Lovely modern apartment, great location, clean and comfortable. 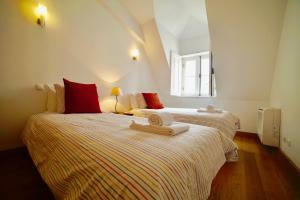 In the heart of Lisboa, close to metro station and to the most interesting sights of the city. Gorgeous and spacious apartment, fully loaded. It was very close to everything. The staff was super friendly and helpful, especially since we arrived on an early train. I would stay there again. Lock in a great price for Chiado Apartments – rated 9.3 by recent guests! 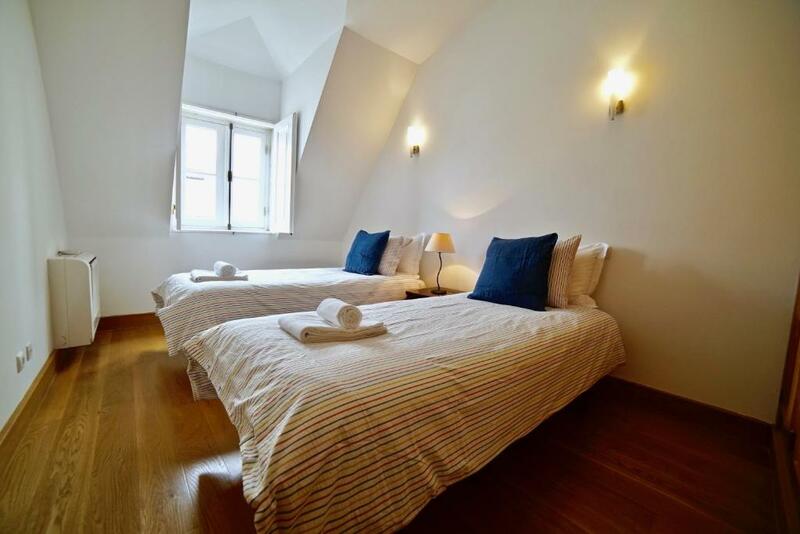 Located in different buildings in the heart of picturesque Lisbon, Chiado Apartments offers guests a mix of the old and the new with luxurious, self-catering apartments featuring modern furnishings and free WiFi. Lisbon Portela International Airport is a 17-minute drive away. The spacious, modern apartments feature air-conditioning, wooden parquet floors, a fully equipped kitchen with a dishwasher and washing machine. Each has a separate dining and seating area with lounge suites, a TV and a DVD player. Guests can wine, dine and shop in the several cafés, restaurants and shops that are located within a 5-minute walk from Chiado Apartments. Historical neighborhoods such as Bairro Alto and Baixa Pombalina along with several museums, sites and churches such as Belém Tower, Praça da Figueira and Museu Arqueológico do Carmo are within a 10-minutes’ walk away. Baixa / Chiado Metro Station is a 2-minute walk away. Sintra-Cascais Natural Park is a 45-minute drive away. Chiado Apartments offers an airport shuttle service upon request. 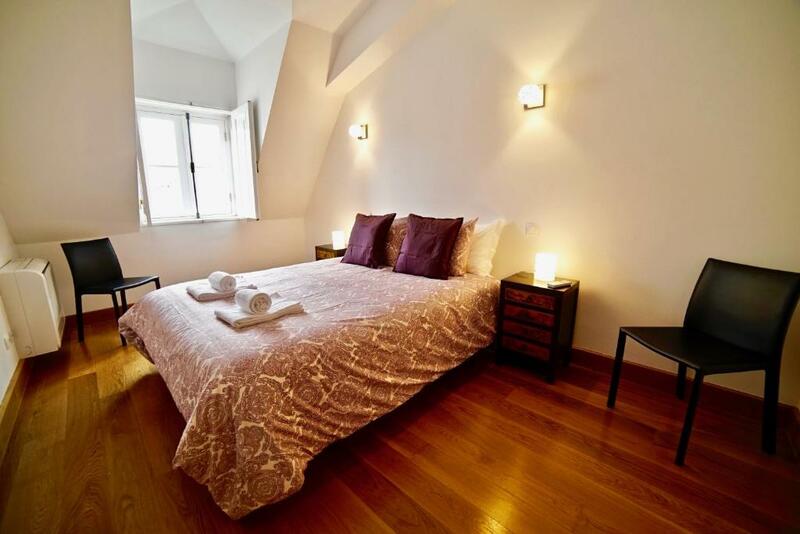 뀐 Located in the real heart of Lisbon, this property has an excellent location score of 9.8! 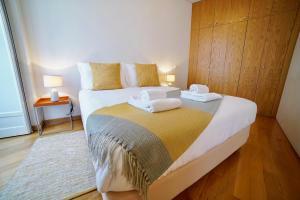 When would you like to stay at Chiado Apartments? Located at Praça Luís de Camões, 28, this spacious and luxurious apartment comes with city and landmark views. It features air-conditioning, wooden parquet floors and a fully equipped kitchen with a dishwasher and washing machine. Each has a separate dining and seating area with lounge suites, a TV and a DVD player. The apartment comes with a modern private bathroom with free toiletries. Located at Rua Nova do Almada, 81. This spacious and luxurious apartment comes with a balcony with city views. It features air-conditioning, wooden parquet floors and a fully equipped kitchen with a dishwasher and washing machine. Each has a separate dining and seating area with lounge suites, a TV and a DVD player. The apartment comes with a modern private bathroom with free toiletries. Located at Praça Luís de Camões, 28. This spacious and luxurious apartment comes with city and landmark views. Located at Rua Garrett, 26, this very spacious and luxurious apartment has a balcony with city and landmark views. Located at Rua Garrett, 26, this very spacious and luxurious apartment has a balcony with city and river views. Located at Rua Garrett, 26, this spacious and luxurious apartment comes with a balcony with city views. Located at Rua Garrett, 26, this spacious and luxurious apartment comes with city views. It is located at Rua da Misericórdia, 4. It features air conditioning, wooden parquet floors and a fully equipped kitchen with a dishwasher and washing machine. Located at Rua da Misericórdia, 4. This spacious and luxurious duplex apartment comes with 2 bedrooms and has city views. The bedrooms and bathroom are located on the lower floor whiled the living room and kitchen are located on the upper floor. The modern private bathroom includes free toiletries. It has air conditioning and heating, parquet floors and a fully equipped kitchen with dishwasher and washing machine. The apartment includes a separate dining area, living area, a TV and a DVD player. . This spacious and luxurious duplex apartment comes with 2 bedrooms with queen size beds, 1 bedroom with 2 single beds and 2 bathrooms. The bedrooms and bathrooms are located on the lower floor while the living room and kitchen are located on the upper floor. The modern private bathroom includes free toiletries. It has air conditioning and heating, parquet floors and a fully equipped kitchen with dishwasher and washing machine. The apartment includes a separate dining area, living area, a TV and a DVD player. Located at Rua Garrett, 26, this studio apartment has plenty of natural light and a separate bedroom. Accommodations consists of one bedroom with a queen size bed, one full bathroom and fully equipped kitchenette. The living room has air conditioning, a dining table and seating area with TV with international channels. This 3-bedroom unit is located at Rua da Emenda, 38. The 4th floor apartment is in Lisbon's historical center. This accommodations is consisted of of 3 bedrooms, 2 bathrooms and a WC. The living room comes with dining and seating areas. 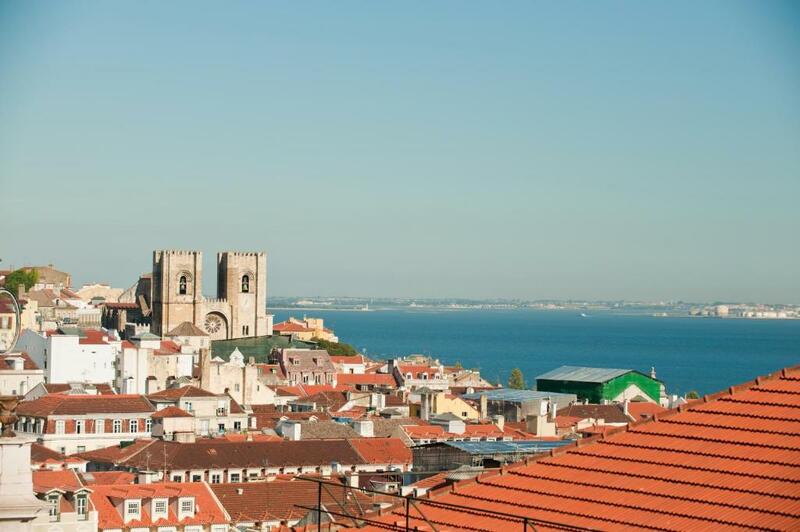 There is also a fully equipped kitchen and balcony with view over the Tagus River. Free WiFi and heating available in all the rooms. 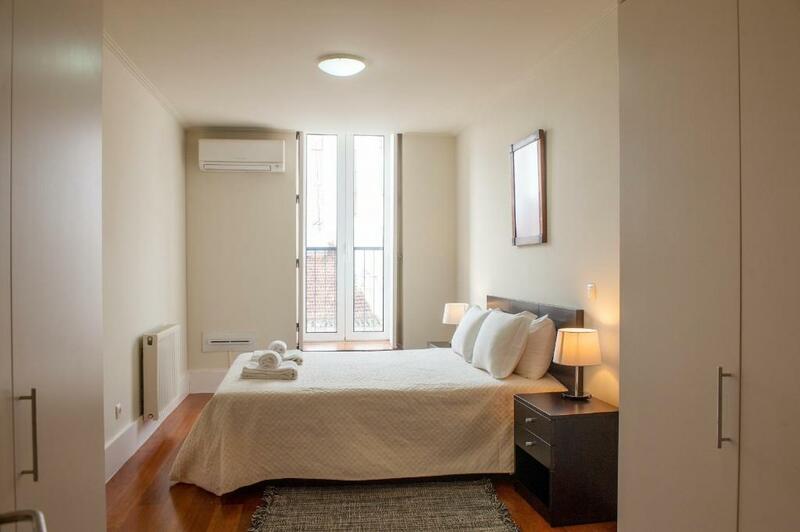 This apartment is located at Praça Luís de Camões 28. It is at one of the most recognizable squares in Lisbon. This 4th floor apartment has 3 bedrooms, 2 bathrooms and an extra WC. It has free WiFi, air conditioning and heating in all the rooms. Chiado Apartments, with apartments in different locations around Chiado area, offers visitors high level accommodations in beautiful and elegant apartments available for short or long term stays. Finding a quality and well located apartments in Lisbon can be challenging, however here you'll find the most sophisticated styled apartments for business travellers as well as for families on vacation. In addition, all of us at Chiado Apartments are committed to providing our clients with superior service and dedicated performance. We are here to help you, all you need is just to make your choice and we will take care of the rest! 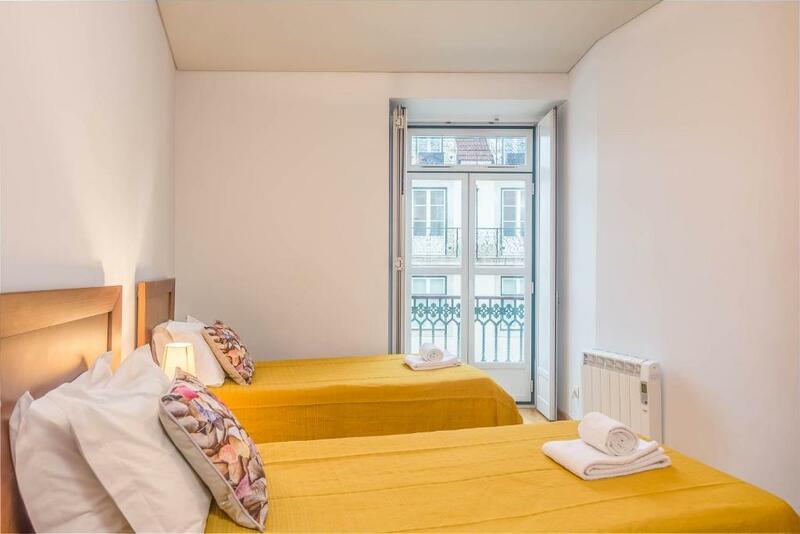 The Chiado is a Lisbon’s neighbourhood with a privilege situation in the heart of the cultural and historical part of the city (Bairro Alto and Chiado), very close to several museums, operas, theatres and churches. Your sightseeing starts at our doorstep! House Rules Chiado Apartments takes special requests – add in the next step! Chiado Apartments accepts these cards and reserves the right to temporarily hold an amount prior to arrival. Please note that each apartment has a different location. Please check their individual description. - EUR 50 after 00:00. From the distribution box next to the elevator a beep sounds every 3-5 seconds. We could hear the beep from every room, even if the doors were closed. At the beginning we did not really hear that, but after a few days it got pretty annoying. The kitchen is huge, but with many empty cupboards and we missed many simple utensils such as a cutting board, a good knife to cut, pasta strainer ... etc. Also, the sofa could be changed, it is already very worn. The Apartment was very clean and the location was perfect! All in the heart of the Baixo/Chaido. Hallway lighting could have been brighter. Location was perfect! Right in the city center. It was easy to get into the apartment with the codes, the instructions were clear. Also all communication via msgs was easy and the hosts answered right away. They also were very accommodating in organizing a baby bed for us! Big, very spacious apartment in an excellent location, in the center of the best neighborhood in Lisbon. Has all the facilities you need. Luis and Silvia were very responsive and helped us with everything we needed. Thank you for a wonderful stay! It would have been great to have a information booklet regarding how to use the appliances in the apartment and recommendations on where to eat, shop etc. The location was fantastic! The apartment had everything we needed and it was very spacious. 2nd bedroom's mattress was not as comfortable as the other ones. Very good location. Right in the centre and yet very quiet once you are inside the flat. Small super market near by. Many choices of restaurants and fado venues within 10 minutes walk. How terribly disappointing. This is absolutely misleading marketing! Its advertised with over 40 enticing pictures, but only 3 of them reflect the real property - that too is tricky as only one photo is of the lounge at an angle ( so doesn't reflect how cramped it is), and the other 2 pictures are taken from outside. We actually flagged this with the host but there was no solution/ effort to move us to another property. The ONLY thing that is a ' win' is the location as it is in the heart of the Baixo/Chaido. It feels as if the hosts have decided that since they have spent a lot of money on sound proofing the apartment, everything else can be forgotten. The damaged couch was covered in an unwashed smelly cover ( which we immediately took out as we were travelling with our toddler). The whole place smelled musty & not aired out, so we had to keep the windows open even though it was chilly for our daughter, just to get the odour out. Some floorboards had become loose & were nailed down but the nails were popping up. The bathroom was leaking from under the bathtub & on the very first day the shower curtain ( which was just a suction type fixed rail!) fell on my head while I was bathing my 2 year old & narrowly escaped injuring her! Neither she nor I were even touching it, as it looked unclean, so it just gave way when we had pushed it to the side! The towels were thin & threadbare & we had to go buy some new towels for use. We requested some extra bedding which was brought over by a cleaning lady in the building and so it was a saving grace that the sheets/duvets seemed to have been laundered. We were tempted to move out but had no option as it was fully pre -paid. Another aspect to flag is that the host agreed to store our luggage for us for 3 nights, but they informed us the evening before the drop off that the lockers were full!